So, what does it mean to be Welsh these days? Is it about the thousands of years of history and culture that we can look back on and be proud of? Is it the ancient language that has adapted with it’s people to become a symbol of legacy, culture and passion? Is it the awe-inspiring scenery and magnificent sea views? Or is it indeed, all about the food…….? Read on to find out! Up until a few years ago, it wasn’t too cool to be Welsh; Wales was mainly associated with dozy sheep, dozy farmers, coal mines, slate mines and a fierce anti-English movement. But, then came the Cool-Cymru campaign, not least boosted by a glut of Welsh bands and musicians that hit the charts in the mid 90’s. From the Stereophonics to the Super Furries, and the Gorky’s to Goldie Lookin’, it was suddenly cool-io to hail from Wales. So what about the food that fed a generation of artists and musicians? What culinary delights did they feast on in their Welsh homes? It’s probably fair to say that once upon a time little ol’ Wales would struggle to compete with the delicate delights of French, Italian, Indian or other such classical cuisine ranges, but today, top chefs are putting Wales back on the map. Welsh cuisine grew up around the diet of the working man. Rewind even just seventy or eighty years ago and life was tough for the average Welsh farmer, miner, quarryman or fisherman. Conditions were harsh, the weather was inhospitable beyond measure, and food wasn’t exactly plentiful. They ate what they had, and they made the most of what the wet and wild landscape could give them. Food in Wales has always been about local, seasonal and traditional produce sourced from people and places that are neighbours and friends; long before “seasonal” and “local” became the biggest foodie buzz words of the twentieth century. Think enormous crock-pots on an open fire, full to bursting with hearty, thick stews and soups, or cawl as they are known here in Wales. Usually made with leftover pieces of lamb, or mutton in winter, with whatever vegetables were around and a bit of bacon if you were feeling really extravagant. Faggots, Glamorgan sausages (not a meaty sausage at all, but a kind of sausage shaped pattie made with cheese, onion and breadcrumbs) and Snowdonia Pudding (a kind of heart-attack inducing suet and dried fruit pudding) are among the other treasures that stake their claim as traditional Welsh delicacies. And let’s not forget that Wales produces some of the best lamb in the world; the salt marsh lamb that comes from the marshes of North West Wales is famed for its delicate taste and subtle flavour. The huge variety of sea marsh plants that the lambs munch on daily (grasses, sea lavender and samphire to name a few) mean that tastier, sweeter meat is produced. And, as the salt in the plants kills of some of the more harmful bacteria, the lambs aren’t pumped full of chemicals and pesticides. Everyone’s a winner! Bara Brith is the famous speckled fruit loaf, and the little griddled Welsh cakes are traditionally served up full of dried fruit, a little spicy and spread thick with welsh butter. For seafood lovers among us, there are cockle cakes, or Teisennau Cocos, a kind of cockle pancake and Bara Lawr, or Laverbread, is fast coming back into fashion, but isn’t for the faint hearted. Best described as a gloopy, thick, dark and seaweed-y (yep, it’s made out of the rich, green seaweed found on the rugged coasts of west Wales), it’s nothing like bread in the traditional sense. It became for a while, the must-have ingredient on any Michelin menu worth its Anglesey Sea Salt. 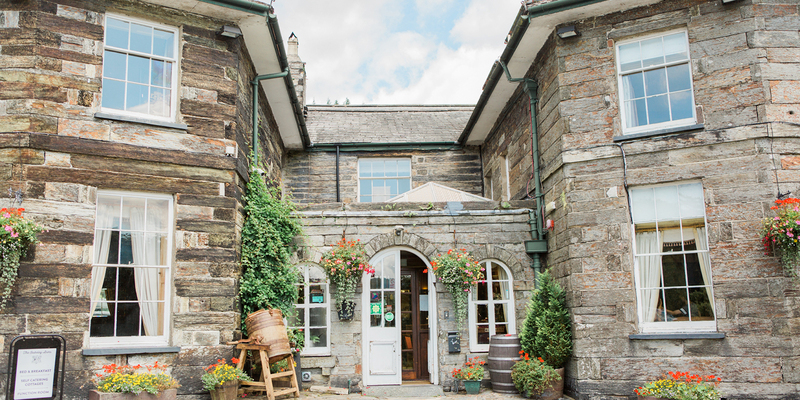 And there are plenty of tasty local and traditional Welsh treats on our menu here at the Oakeley Arms, so if this has inspired you to have a taste of Wales then come and join us! Click here for more information on our restaurant and bar food. …….that the town of Wrexham in North East Wales was one of the first places in the UK to brew lager? The brewery was set up by German immigrants in 1882 who were trying to re-create the taste of their local sup from home.